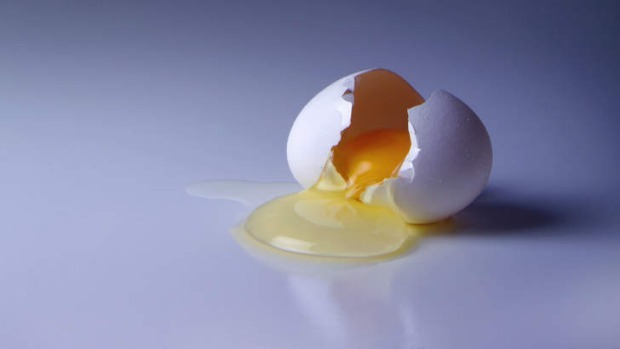 How many times have you been at that crucial point in your recipe, when you realise you're out of eggs? You rush to the local supermarket and reach out to grab your box of free-range eggs. But you get stopped in your tracks, bamboozled by all the different labels and descriptions. Eggs ain't eggs no more. I know I'm not alone in being a working mum of young children who simply wants to be able to buy eggs that are what they say they are, safe in the knowledge I am doing the right thing by my family and our feathered friends. But where once we may have trusted the words ''free range'' to mean just that, today we are bombarded with soft and fluffy slogans and photos such as ''free to roam'', ''open range'' and ''environmental eggs''. Where has the humble free-range egg gone? Good Food has done some digging in an attempt to unscramble the message. Can I trust what I read? Australia's 400-plus egg producers fall into one of four categories: cage, barn, free range and organic. Organic production aside, there is no enforceable national standard on what the others can and can't call themselves. You may notice some egg cartons carry a stamp or certification. Certification, which involves sticking to various standards set by a range of bodies and then displaying their stamp of approval, is not compulsory. Those producers who do choose to apply for certification will be independently audited. So the system only serves to keep the honest farmers more so. "It is imperative farmers abide by the Competition and Consumer Act as well as relevant state laws and regulations when labelling their eggs," says the president of the NSW Farmers' Association egg committee and Australian Egg Corporation Limited member, Bede Burke. "All labels should be accurate and truthful and not mislead consumers." Should be, but this isn't always the case. I've heard there is a Model Code for farmers to follow. What is this? The Model Code recommends conditions and limits for broods, but this is voluntary. It was created by the Animal Welfare Committee of the Primary Industries Ministerial Council in 2002 to give minimum standards for the husbandry of layer hens in cage, barn and free-range systems. The definitions for each are relatively simple - for example, the Model Code describes ''free range'' as birds that are "housed in sheds and have access to an outdoor range". However, the comprehensive 38-page document is very specific when it comes to things such as minimum access to the outdoors, optimum ground conditions and shade, and predator protection for free-range chickens. But again, the code is only voluntary. So there are no enforceable rules. What does that mean for me, as a consumer? "In the absence of standards, producers have taken great liberties in what sorts of conditions are behind the eggs they label as free range," says Angela Cartwright, the campaign manager for consumer advocacy group Choice, which has been very vocal in its support for a nationally enforceable standard. "There is an extraordinary variation on conditions, and this means when a consumer goes to buy egg products, they really have no confidence at all that a claim alone will meet their expectation of what 'free range' means." Added to that, she says, the words ''free range'' seemingly give producers the right to "command a price premium". Some of the cartons carry stocking densities. What does this refer to and can I trust it? The Model Code also recommends that free-range chickens should only be run outside at 1500 chickens per hectare (known as stocking density). Yet according to Choice, up to 30 per cent of producers who label their eggs free range have stocking densities of 20,000 chooks per hectare, more than 13 times the recommended ratio. The Model Code does allow for a higher stocking density, but only in cases where the chooks are continually rotated to fresh pastures. There are those, including the producer-owned company Australian Egg Corporation Limited, who argue there are ways to safely increase stocking densities up to 20,000 per hectare and, in fact, the corporation is seeking to do so; while Woolworths Select and Coles brand free-range eggs have stocking densities of up to 10,000 chooks per hectare. "There are absolutely other considerations beyond the stocking density question, but the fact is we have a Model Code," Cartwright says. "It's voluntary, but it sets a very strong guide, and that guide is 1500, and we don't think that profit-making enterprises [such as supermarkets] should be the ones varying those standards because we don't think they necessarily have the consumers' best interests [at heart]." In what some consider a win for the consumer, the big supermarket chains have responded to consumer concern about caged eggs and have begun phasing them out. There may be some light at the end of the tunnel. The Model Code was due to be reviewed by the Department of Agriculture, Fisheries and Forestry in 2010, in conjunction with various stakeholders. And there are plenty of producers hopeful a review will result in the voluntary code becoming enforceable. But to date the review hasn't happened. "What we need is a standard to force producers doing the wrong thing to come into line. Because at the moment they're making profits out of misleading people and undercutting their competitors," Cartwright says. What is the effect of the ''fake free-rangers'' on honest egg producers? You couldn't get much closer to embodying the free-range ideal than Anne and Warryn Stuckey and their Berrima Ridge eggs. The Stuckeys' 5000 hens had 20 hectares on which to roam, and an additional 20 hectares reserved for a wildlife corridor for wombats, echidnas and kangaroos. The chooks, which Anne affectionately refers to as ''the girls'', fed on pasture during the day and sheltered in mobile hen houses at night, transported to a new paddock once they had eaten down their existing one. The eggs were sold to cafes and shops in the Southern Highlands and through IGA outlets and a handful of cafes in Sydney, and there was often a waiting list for more. 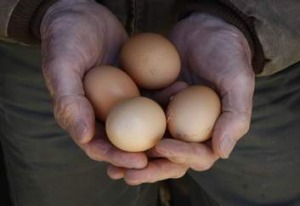 In fact, for three years Berrima Ridge was certified organic, after which they continued supplying free-range eggs. Two years ago, however, the Stuckeys were forced to sell Berrima Ridge, crippled by the high costs of this labour-intensive farming, and outpriced by the so-called ''fake free-rangers''. "We realised the term 'free range' was being hijacked by what I call the fake free-rangers, so we didn't even put 'free range' on it, we put 'hens roaming free on pasture'," says Anne, adding that customers had become so suspicious of egg packaging in general that they would often leave a shop without buying their product. "It's a constant battle to try to stop the big boys mislabelling things," adds Warryn. I'd like to support free-range egg producers. What should I buy? For the time being, shoppers trying to discern a true free-range egg are left to their own devices. Check stocking densities, read up on certifications and check what each definition means, urges Choice. "Don't believe the fake photos [on the egg cartons]," adds Anne Stuckey. "They're either free-range or they're not. Are prisoners free-range? They live inside and are allowed out for a bit of exercise. They're not free-range. People need to be assertive and question everything." According to the 2012 Retail World Grocery Guide, free-range eggs experienced the most growth in the egg market that year. Today, almost 40 per cent of Australians choose to buy free-range eggs, often at a premium price. This is an issue that demands attention; surely it shouldn't be this hard? At Mulloon Creek they have 15,000 chooks across 580 hectares - that's only 150 birds per hectare, "because we're right into sustainable farming". The chooks are raised in an open-range system and sleep and lay in a mobile shed. Their food and water is kept outside, encouraging them to leave the shed. "I've never seen chooks so stress-free and happy, having come from intensive farming," says Cowling, who has 28 years' experience. 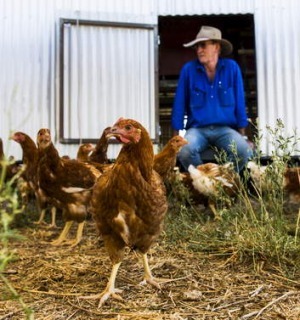 "I go into the paddock and the chooks follow me like a dog." Eden Bruessow is the owner of the small family-run business Glenrose Eggs in Kyogle, northern NSW, where they run about 2000 chooks on the 40-hectare property. The hens feed on permanent pasture, with areas of land fenced off and regularly rotated. Given the small size of the stock, Bruessow says they prefer to do all the work themselves without the use of machinery. "It's intensive, but I have a passion for the chooks.We're very old-fashioned. [Most] egg producers put colouring in the feed to make the yolk darker. It's not ridgey-didge," she says. "We don't, so depending on the season ours will be dark or pale." Jacqui and Jim Steele's decision to begin farming chooks came out of a desire to do something else with their 16-hectare property in Orange, which included 8 hectares of vineyard. What began as 500 chooks has expanded to 2500 (the stocking density is 400 per hectare) and demand now outstrips supply. They sought and received accreditation from Humane Choice. "We have to get that message across, that free range can mean a broad section of things; yet chooks, like all of us, need sunlight in order to exist. Sunlight is really important and impacts so much on the flavour of the eggs," Jacqui says. The Egganic chooks forage outdoors during the day and have a mobile henhouse for shelter at night. "Our eggs are probably less uniform because the chooks are doing their own natural thing - one might be eating a witchetty grub and another a Christmas beetle, so you will get different colours coming through in the shells." At between $9 and $12 a box, Egganic eggs are at the more expensive end, but Jacqui points out it's only $1 an egg. Owner and geneticist Dr Jeffrey Moth is quick to point out Nulkaba Farm, near Cessnock in the Hunter Valley, is "very, very small", but those who buy and eat their eggs are converts. Set on 60 hectares, Nulkaba Farm is a family business that has been in operation since 1976. Although they only have 1000 chooks, the business also supplies duck and quail eggs to restaurants in the Hunter Valley and Goulburn area. They also breed and develop stock to sell, including layer chickens, ducklings and meat chickens through the Nulkaba Hatchery. Moth says the "extremely confusing" labelling of chicken eggs has arisen through a lack of regulations dictating what's what. "Our chickens are free range - that means they have access to green pastures from sun up to sunset [they roost in a shed at night], they're not in cages, they have all the normal areas to dust-bathe, climb on perches and they're generally not beak-trimmed," he says.